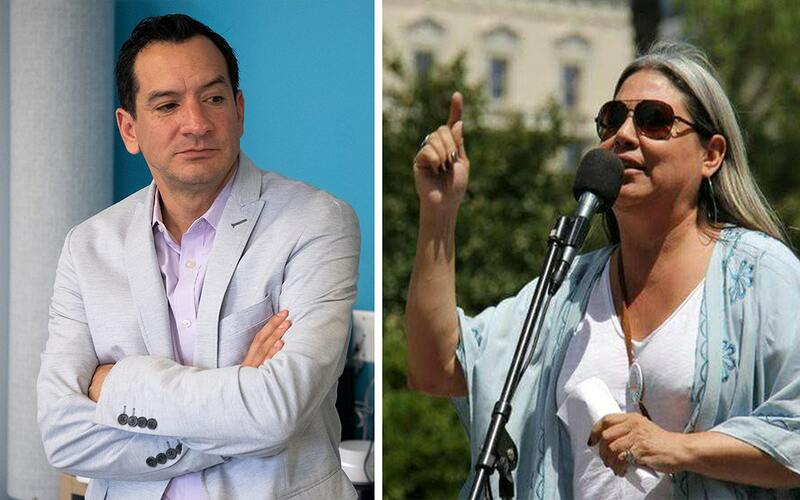 Anthony Rendon and Maria Estrada are running for the 63rd Assembly District this Nov. 6. (Left photo by Thomas Cordova; right photo by A. Irene de Barraicua). When Assembly Speaker Anthony Rendon shelved a bill last year that would potentially create a universal health care system in California, many protested—and even launched a recall campaign. While efforts to oust the politician have since fizzled, Rendon’s decision on Senate Bill 562 did spawn a challenger. On Tuesday, Nov. 6, voters will get to decide between re-electing Rendon or voting in community activist Maria Estrada to represent the 63rd Assembly District, which includes North Long Beach, Bell, Cudahy, Hawaiian Gardens, Lakewood, Lynwood, Maywood, Paramount and South Gate. Estrada said she decided to run for office after seeing Rendon kill the bill and fail to act on other environmental issues that greatly affect the district he represents. “The Speaker showed his indifference to the plight of the people of the 63rd when he shelved single payer healthcare bill SB 562, stopped the legislative process, and showed how unwilling he is to help the people of this community and is complicit in the environmental genocide occurring in Southeast Los Angeles,” Estrada told the Post in an email. If elected, she said she will focus on environmental justice and fiscally responsible healthcare and banking systems. But Rendon, who was elected into the Assembly in 2012 and became Assembly Speaker in 2016, says those issues are important to him too. His priority is to make healthcare more affordable for Californians. While 93 percent of Californians have healthcare coverage because of the Affordable Care Act, more needs to be done to control costs and reach full universal care, Rendon’s political advisor Bill Wong said in an email. Months after Rendon tabled SB 562, he announced the formation of a committee to develop plans to achieve universal healthcare. The assemblyman is also focusing on making housing affordable in his district and improving quality of life by expanding parks, revitalizing the river and promoting the arts, Wong said. “These values and priorities are all in line with the residents of the 63rd,” Wong said. The 63rd is majority Latino, but some members of the Jewish community have felt attacked by Estrada’s outspoken opinions, going so far as calling her anti-Semitic. In July, publications like Tablet Magazine, Haaretz and Newsweek and even the Anti-Defamation League all wrote critically of Estrada, linking her to black nationalist Louis Farrakhan who is considered an anti-Semite, as well as her online opinions calling Palestinians victims of Israel’s genocide. However, she has previously defended her stance, saying she is anti-Zionism and not anti-Semitic. “The Israeli-Palestinian conflict is not a matter of religion, but a matter of indigenous rights and colonization of lands,” Estrada told the Post. Click here for Estrada’s campaign website and here for Rendon’s campaign website. Democratic incumbent Assemblyman Patrick O’Donnell is running against Honor “Mimi” Robson, who is chair of the state Libertarian Party. They are vying to represent the 70th Assembly District, which includes Long Beach, Signal Hill, San Pedro and Catalina Island. Since elected in 2014, O’Donnell has focused heavily on education-related legislation. Robson is an engineer who believes in lower taxes, small government and individual freedom. At a candidate town hall hosted by McBride High School students last week, both candidates said they are against the local controversial Measure BBB, which would change the city’s term limits. Republican candidate Theresa Sanford will be up against Democratic incumbent Mike Gipson for an Assembly seat that covers parts of North Long Beach, South Los Angeles and the South Bay and unincorporated areas of the county. Gipson has presented legislation on clean water in Compton in light of the discovery of brown water in households, affordable housing, youth homelessness and health-related issues. Sanford is a middle school teacher and has volunteered at animal rescues and shelters. She aligns herself with the state Republican Party platform. This Republican-held Senate district encompasses mostly Orange County cities, but covers portions of Long Beach. Incumbent Janet Nguyen is facing Democratic challenger Tom Umberg to keep her seat. Nguyen has sponsored legislation benefiting military families and veterans and has received endorsements from numerous public safety organizations. Umberg says he supports Prop. 1, an affordable housing bond meant to aid low-income homebuyers and veterans. Alan Lowenthal is running against Republican candidate John Briscoe to keep his congressional seat, which covers parts of Long Beach, Lakewood, Signal Hill, Avalon and a handful of Orange County communities. Lowenthal sits on multiple committees, including Transportation and Infrastructure and Natural Resources as well as multiple subcommittees. He has been an avid supporter of the LGBT community and immigration issues. A licensed broker and small business owner, Briscoe is “well educated,” having an MPA and MBA, according to his campaign website. He says he will “fix” immigration, sanctuary cities, bridges and roads, and the gas and car tax. While constituents in the 44th Congressional District may see two options for a representative, Congresswoman Nanette Barragan is actually running unopposed. Compton Mayor Aja Brown had announced announced in April that she was dropping out of the race, saying she and her husband were expecting their first child. “Clueless” actress Stacey Dash also intended to run for that seat but quickly withdrew, citing “bitterness” in the political process. To find out who your representative is or to view your sample ballot click here.